At the top of the first registration page, after eBay shows the steps of the registration process, fill in some required information. Your full name (eBay keeps this information on file in case the company or a member who is a transaction partner needs to contact you). 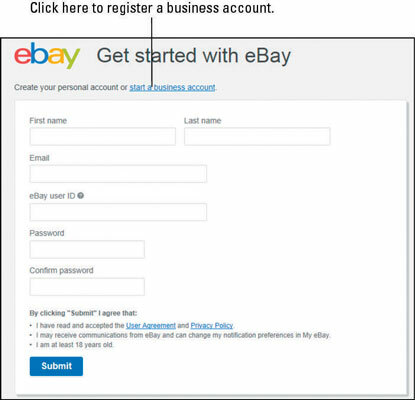 If you have an existing business and you want to register on eBay with your business name, it’s a good idea to click the link that says start a business account. That way you start out on the right foot with a legitimate business registration. eBay will still need your personal information because you represent your business on eBay. Scroll down the page to select your new eBay User ID. Because many of the “good” User IDs are taken, eBay checks the availability of your preferred ID. If your chosen name is taken, try again. (Lather, rinse, repeat.) Finding an awesome User ID can be as difficult as finding an untaken vanity plate at the California DMV. Choose a password, enter it in the Password text box, and then type it a second time in the Confirm password box to confirm it. Depending on the phase of the moon, eBay may have the questions in this step-by-step registration in a slightly different order. Just follow these steps and keep clicking Continue at the bottom of each screen until you’re finished. Create your unique secret question and input the answer. The secret question you select here is used by eBay to identify you if you ever have problems signing in. Do not using any fact that is generally known about you by your friends or in social media. Now eBay will want your contact information. Input your address and primary telephone number. eBay keeps this information on file for future communication. At different points in the registration process, eBay may send you an e-mail or send a text to (or call) your phone to give you a confirmation code. Just type the code you receive from them onto the next page. This is eBay’s way of verifying your information each step of the way. If eBay requires your credit card information (for identification that confirms you’re a real person), it will ask on the next screen. If eBay finds a glitch in your registration, such as an incorrect area code or ZIP code, you see a warning message. This is one of eBay’s security measures that ward off fraudulent registrations. Use the Back button to correct the information. If you put in a wrong e-mail address, for example, eBay has no way of contacting you — so you don’t hear a peep from eBay regarding your registration until you go through the entire process all over again. Click the Continue button and check your e-mail! eBay will send you an e-mail containing a clickable link. Clicking the link from the e-mail opens a window in your Internet browser. Ba-da-boom! You’re registered! To transact business on eBay, you will need a PayPal account. You will be presented with a link to sign up. If you don’t have one, now is the time to sign up. PayPal is safe, and all your information is kept confidentially — with the same level of safety you expect from a financial organization.